Update: after giving the Bellm bolt spring a workout in the 357 barrel, it was noticeably stronger than the Wolff spring so I put a Bellm spring in the 6x45 barrel, too. Eventually all my TC barrels will have Bellm bolt springs. Today we tested a new plain base bullet. Why plain base? Just because I don't have much experience with plain base bullets in rifles, so I see it as a learning experience. I like to try different things and see what works and what doesn't. Since my 357 barrel is shooting plain base decently at 2000 fps, I assumed plain base would work in this barrel at 2000 fps, too, so I loaded accordingly. 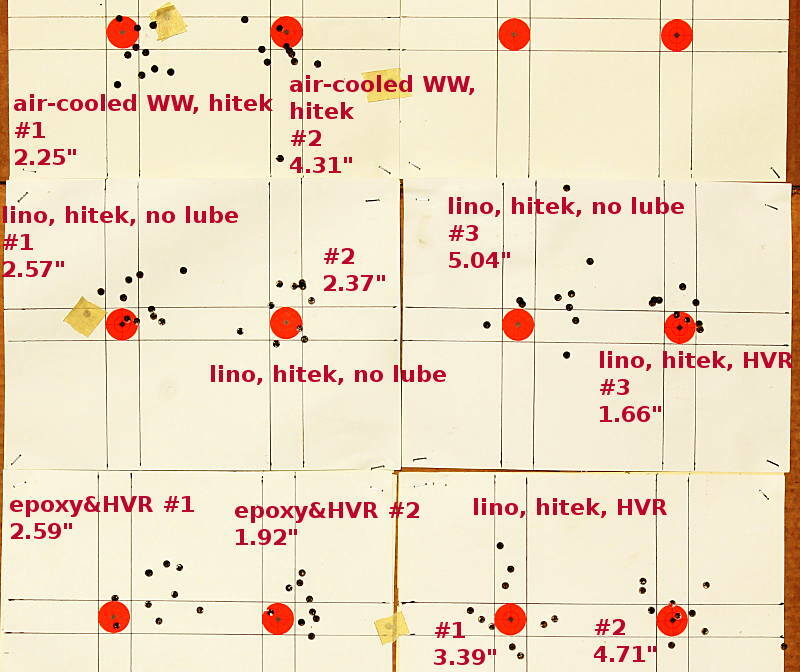 Unless otherwise stated, all of today's loads used oven treated WW, sized 0.246" and nose-sized, Rooster HVR lube, CCI #41 primers, and 0.010" jump to the rifling. -- no visible fouling, and no lead on a tight fitting patch. 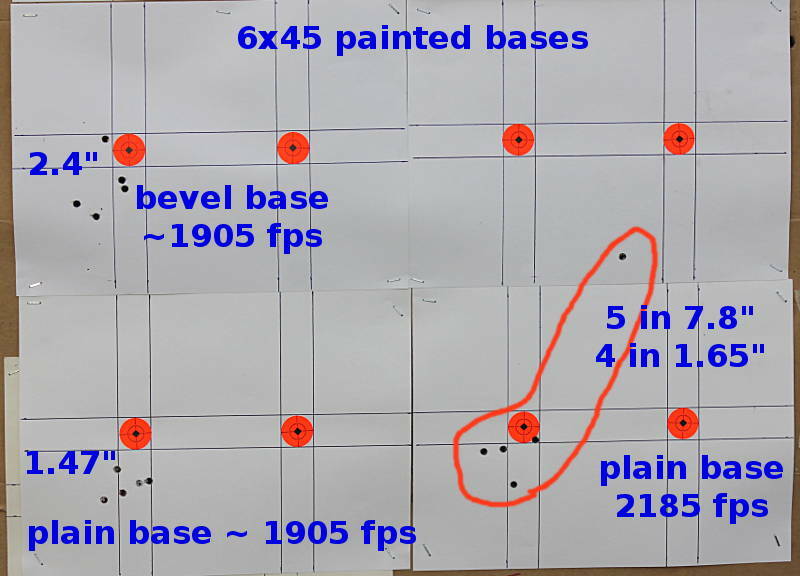 One group at 1813 fps, the other shots at 2100 fps are a wild pattern, with some completely missing the target. -- what the heck ? 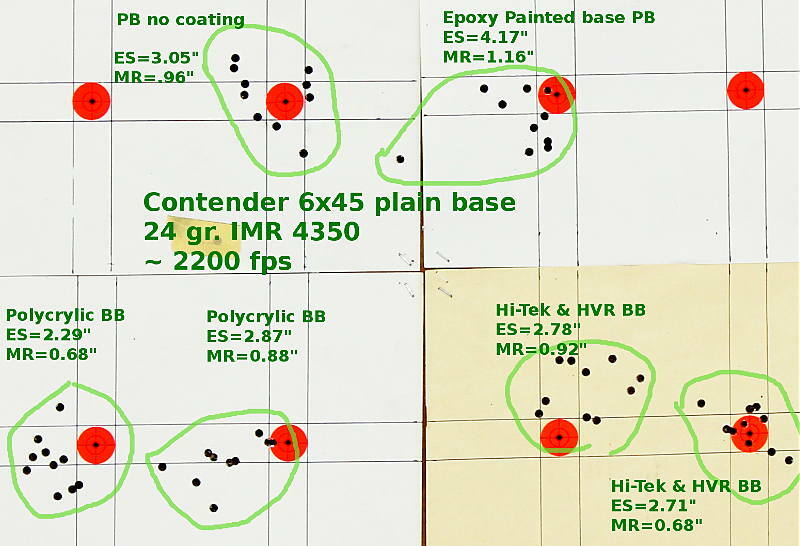 -- why does my 357 barrel shoot plain base decently at 2000 fps but the 6x45 barrel, which is a better quality barrel, can't keep plain base on the target at 2000 fps? -- there was no fouling to be seen, so if they didn't fail due to fouling, then how did they fail ? -- I don't know the answers, but I'd like to find out because whatever is messing with these plain base loads is probably messing with my gas check loads, too. -- possibly use a faster burning powder because the standard deviation was awful with 4350 and 760. Water tank experiment with plain base bullet. The only thing I could see wrong was some erosion at the corner of the base of the bullet. Maybe it got a little too hot and began to melt or gas cut? Of course I could simply use gas checks, but I'm curious to learn how fast plain base can be driven and how they fail. Bases painted with epoxy spray paint. These are plain base, not gas check. -- sized 0.245" x 0.2385"
-- 1927 fps but the chrono was uncooperative and only measured 3 shots. Last time this load clocked 2066 fps. OK, so at least the painted bases hit the target. That's a definite improvement compared to missing the target. Then I upped the powder charge to 24 gr. IMR4350. Fortunately the chrono decided to cooperate and the load averaged 2185 fps, 2.04% standard deviation. 4 shots were in a decent group but there was one bad flyer. Still, there's no doubt that the painted bases performed better than unpainted bases. I had intended to shoot more groups comparing painted bases vs. unpainted, but gave up because of the chrono problems and I was running out of daylight anyway. I'll try to get the chrono working better and then repeat the comparison test to make sure it wasn't a fluke. The winter storms subsided long enough to let me do a little shooting today. Temperature outside was in the low 20's (F) but a small electric heater kept the shooting shack 50 - 60 degrees. Not as warm as I would like, but tolerable. Today's goal was to continue testing plain base bullets with coatings. 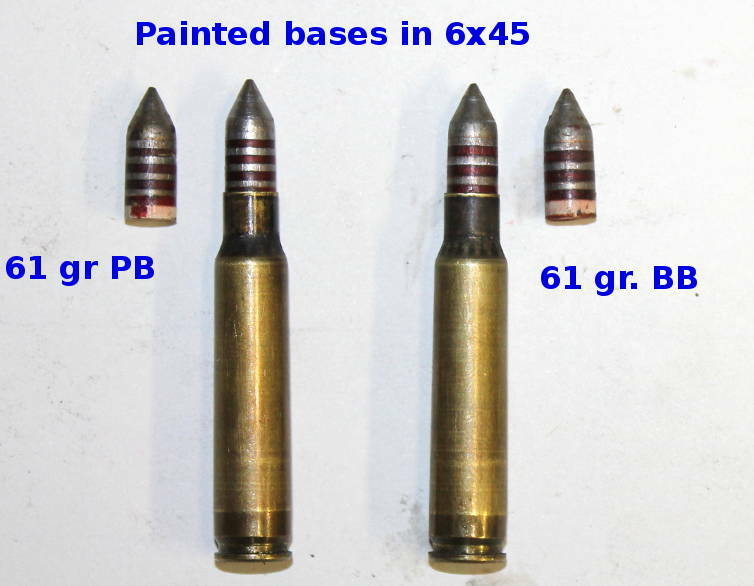 Why plain base bullets? Because if I can figure out how to make plain base bullets work at high velocity then gas check bullets should be a piece of cake, right? We used the same basic 24 gr. IMR4350 load for all of today's tests, only the coating changed. I chose the 24 grain load because it seems to push the plain base bullets fast enough to be right on the ragged edge of failing. No sane person would choose a load that is right on the ragged edge of failing but such a load is ideal for a crazy experimenter because it is sensitive to small improvements or un-improvements. I made new fixtures to hold the bullets base-up while I spray painted them. Most people stand bullets on their bases to coat them, naturally I do the opposite and stand them on their nose. The idea is that the base needs protection more than the nose. I also tried shake-and-dry Minwax polycrylic. I had tried polycrylic previously full strength, but it was too thick and too slow to dry, so this time I thinned the polycrylic with 5 parts alcohol to 1 part polycrylic. Even so it was still a bit thicker than ideal so if I do it again I'll thin it even more, perhaps 7:1. To avoid problems with coating being damaged by oven heat treating, I heat treated the bullets first, then coated them and let them air dry for several days. I applied 3 very thin coats. 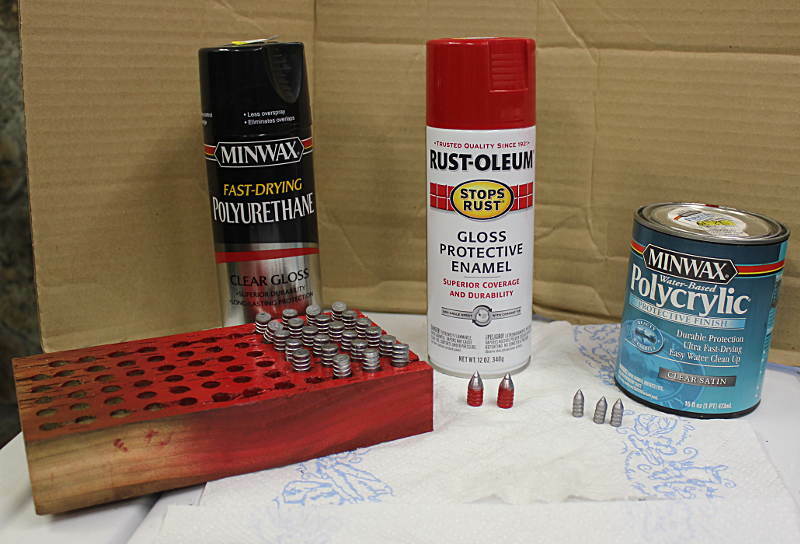 Most of the coatings added a total of 0.001" - 0.0015" diameter but the Rustoleum enamal added 0.003" - 0.004". I don't think it is good for it to be that thick. I resized the bullets 0.245" after the coating dried. Sometimes the Rustoleum would rub off a little during re-sizing. None of the other coatings rubbed off. 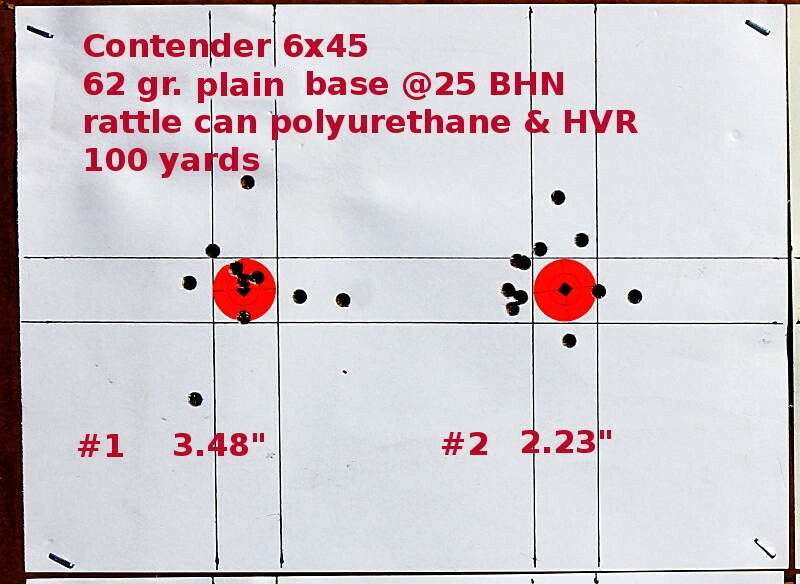 Because I used several different batches of bullets that had been sized at different times, the amount of nose-sizing varied. In the future I'll try to standardize on a common nose-size setting. Here is the first target. 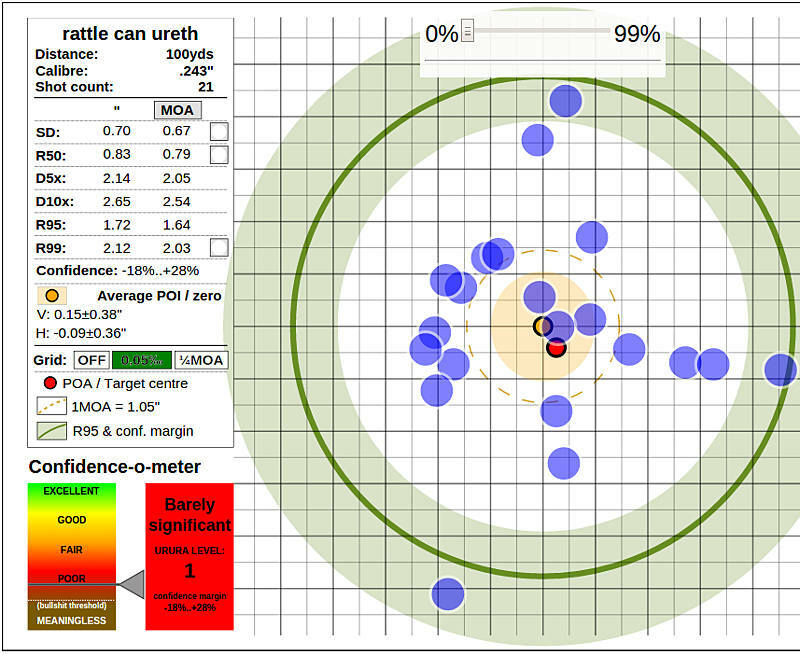 -- to my astonishment the uncoated bullet shot a decent group. 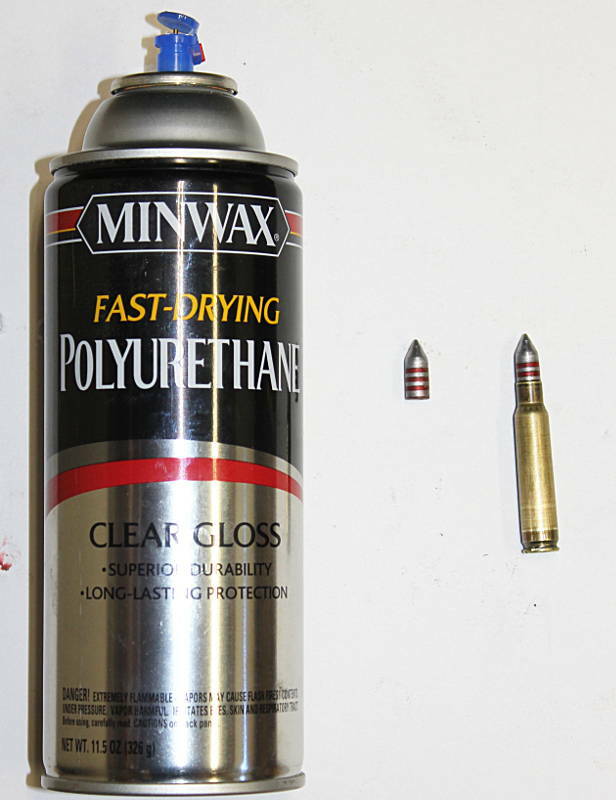 -- the polycrylic coating performed best though not enough shots were fired to "prove" a significant difference. -- I could not detect any leading with any of the bullets, not even the uncoated bullet. No visible leading, no specs of lead on a tight fitting patch. Next up the red Rustoleum enamel. As mentioned previously, the Rustoleum came out too thick, and then it partially rubbed off while re-sizing. I did not expect the Rustoleum to perform well and indeed it did not. It couldn't even keep all its shots on the target backer. I gave up after 10 shots because obviously it was a lost cause. The puzzling thing is that when I tested uncoated plain base bullets back in June, they wouldn't even stay on the target above 2000 fps. So how come they shot one decent group earlier today ??? I dunno, so I retested the uncoated bullets to see if it was repeatable. No, they shot wild. What the heck is going on? 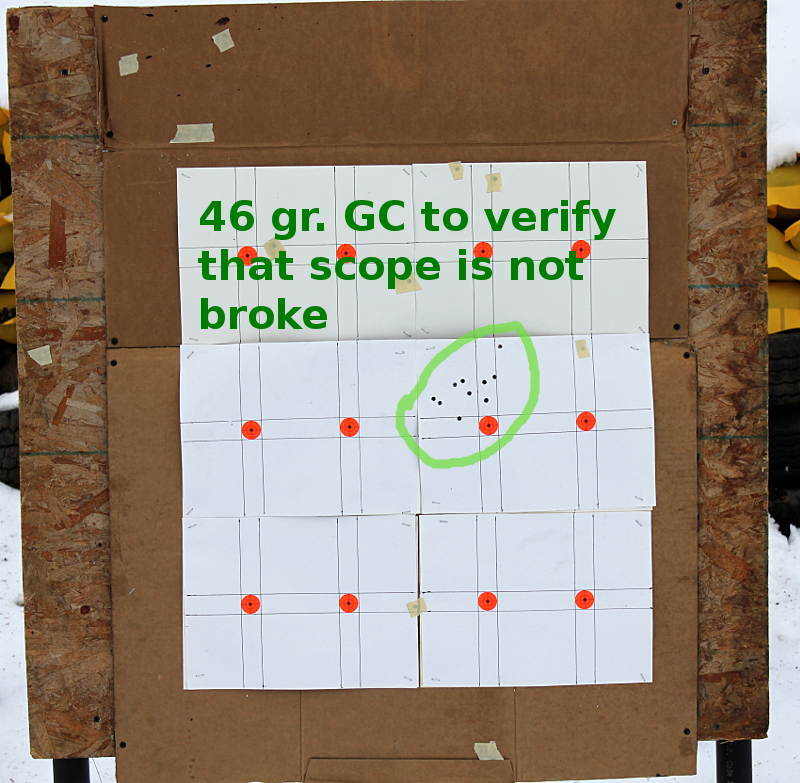 I was starting to wonder if the scope had gone haywire, so for a sanity check I shot a string of 46 grain gas check bullets left over from a previous experiment. The 46 grainers had shot 2.5" - 4.4" groups previously so I was confident they should at least hit the target if the scope was good. Loaded over the same 24 gr. 4350 charge that I used for everything else today. Not a great group but at least it's a group so it appears the scope is OK. It's a Weaver T36 by the way, a decent scope. I forgot to mention that I made some progress with the chronograph problems I was having last time. I found one broken LED in the lights. Problem was that the LED's are wired in series so the one broken LED killed the entire series. I patched across the broken LED to restore the series and it seems to work, today the chrono recorded every single shot, yea ! 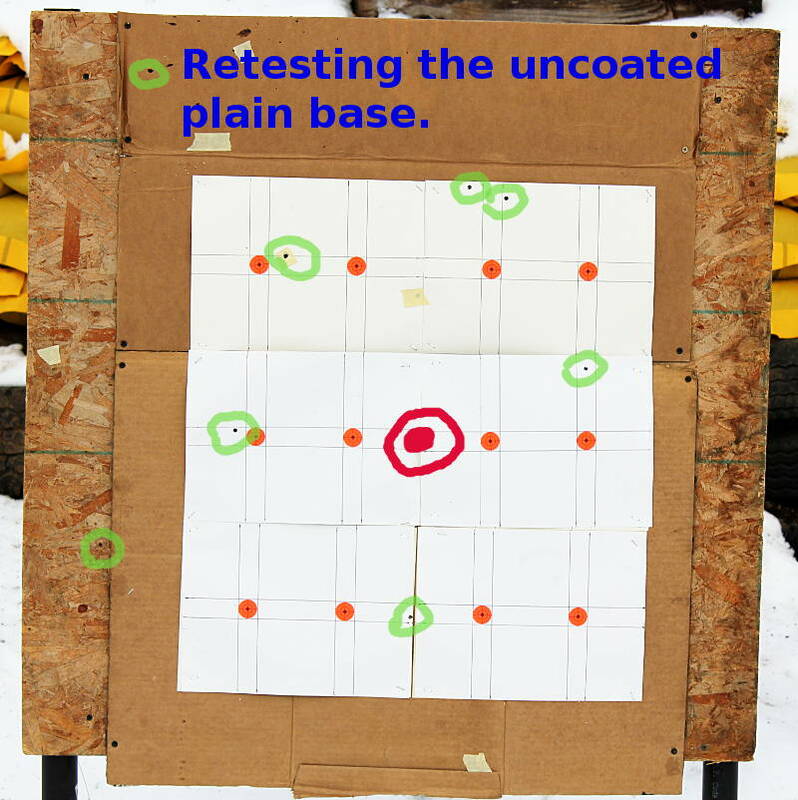 -- I have no clue why the uncoated plain base shot one good group but other times can't stay on the target. 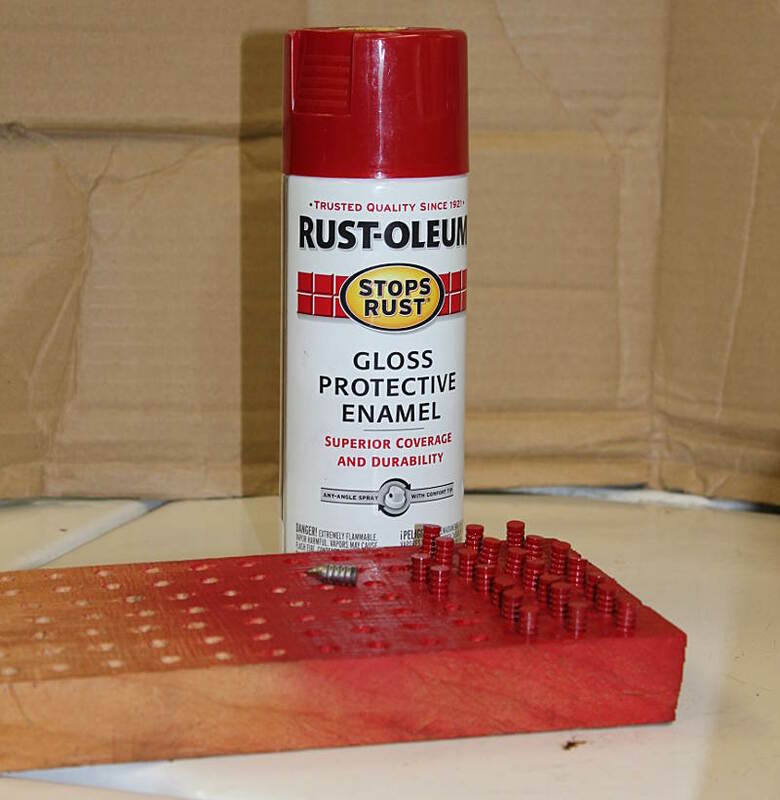 -- Rustoleum enamel is a no-go. -- try to standardize the nose-sizing for a 0.242" front band. -- keep retesting uncoated plain base with the hope that I can figure out why it is so inconsistent? More Coating Tests. Once again I'm sticking with the same load even though it is not an optimized load, because I'm trying to test the coatings, not the load. -- nose sized so that front band was 0.242" on plain base or 0.2415" on bevel base (same setting on nose die). 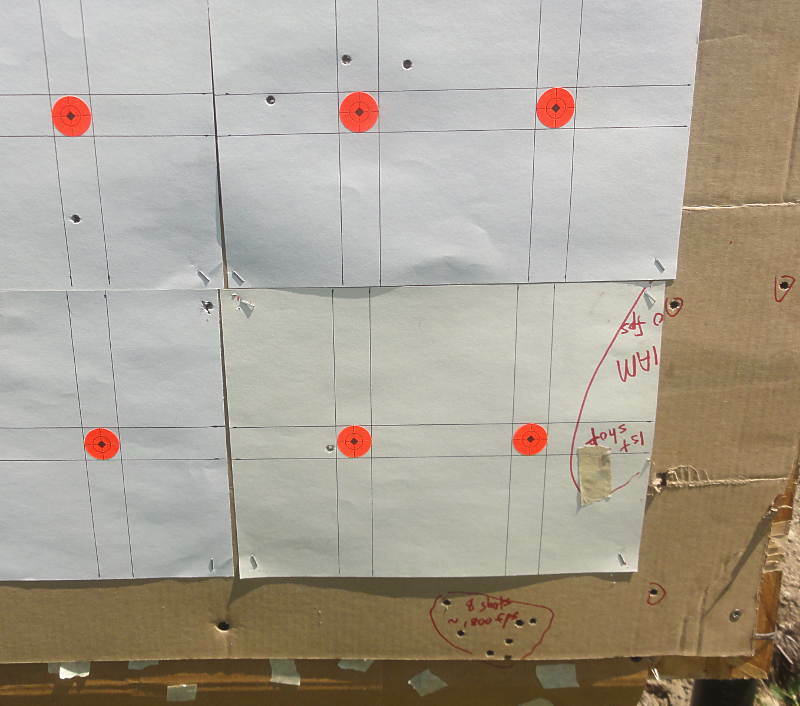 -- 10 shot groups at 100 yards, but some groups had only 9 shots because there were several dud primers today. 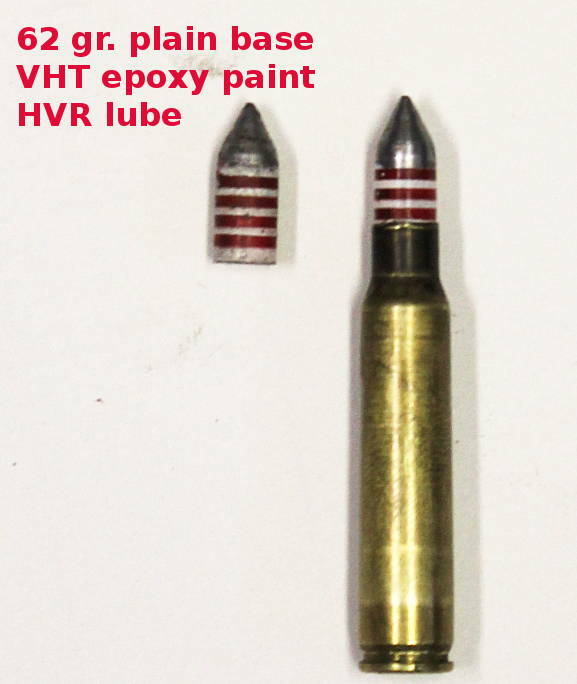 First up, VHT rattle can epoxy plus HVR lube on the plain base bullet. You have to admit it's pretty. 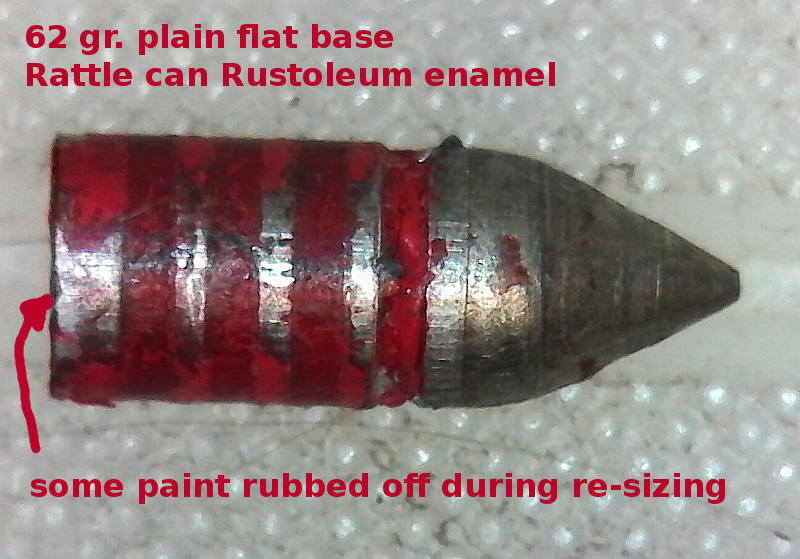 This wheelweight bullet was oven treated at 475F before coating. 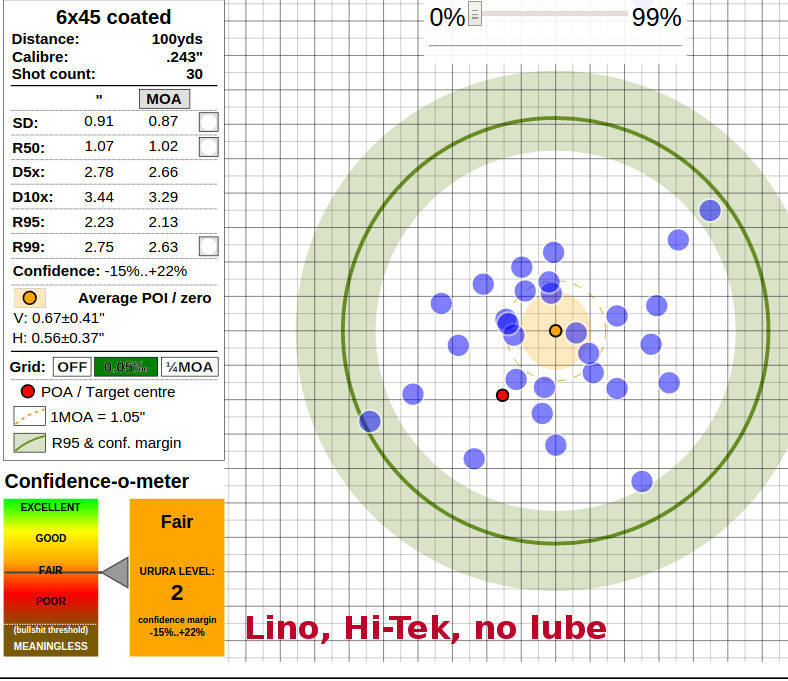 -- mean radius = 0.81"
Next, a lino plain base, hi-tek coating, plus HVR lube. -- mean radius = 1.00"
Next, a lino bevel base, hi-tek coating, without lube. -- mean radius = 1.07"
-- mean radius = 0.95"
Today's target. No bragging size groups, but no wild groups, either. 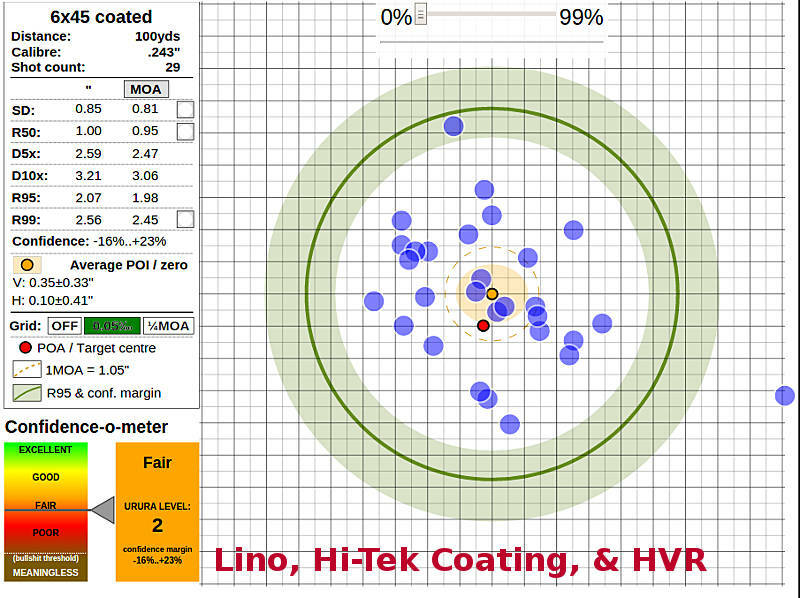 The accuracy differences between coatings were too small to be considered significant. 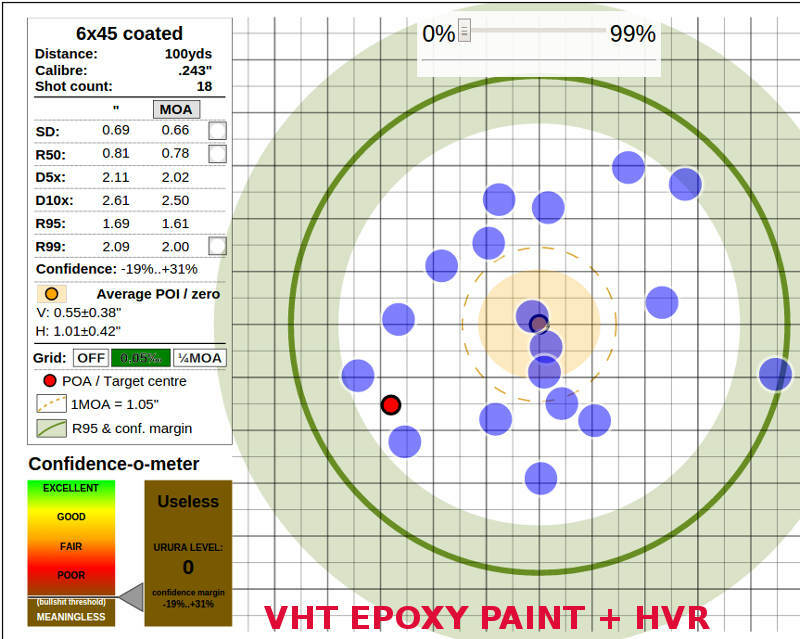 -- VHT rattle can epoxy seems to be a satisfactory coating, at least at this velocity. -- Hi-Tek seems to be a satisfactory coating, at least at this velocity. -- when both are coated with Hi-Tek, air-cooled WW seemed to be just as accurate as lino (at this velocity). I was surprised. -- none of today's loads leaded the barrel. No leading visible to the naked eye, and no lead specs on a tight fitting patch. -- the only bad thing about the coated air-cooled bullets was that velocity was 48 fps slower. 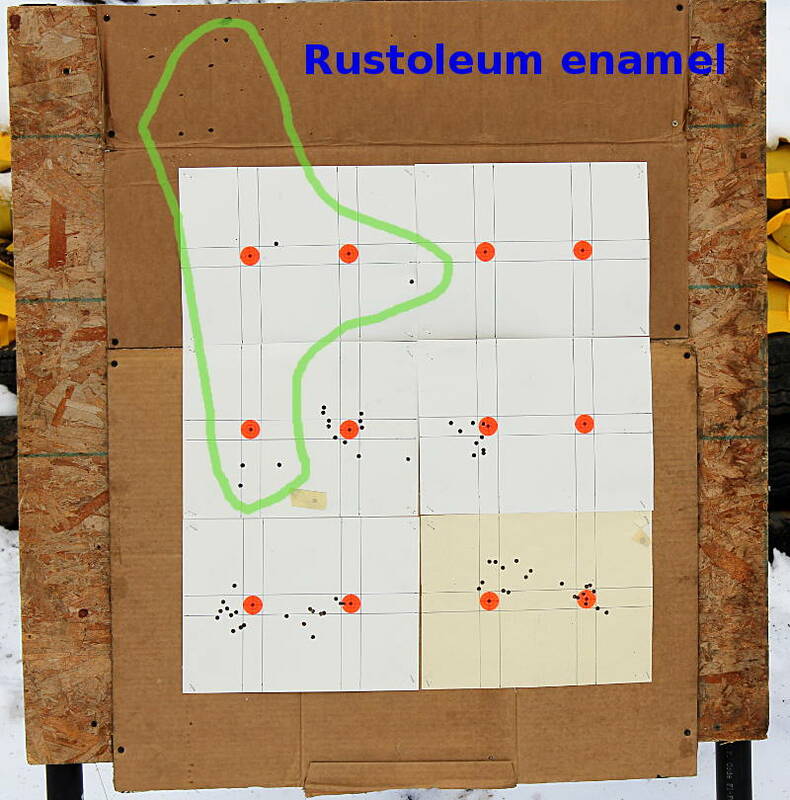 -- in general, most of the coatings improve accuracy at this velocity compared to an uncoated bullet. Bear in mind that the uncoated bullet sometimes struggled to stay on the target with this powder charge. -- once I settle on a pet coating combo, I'll try ramping up the velocity. Testing another coating, with the usual bullet and load. 3 very light coats of rattle can polyurethane. The 3 combined coats added about 0.001" to the diameter. I fired one fouling shot, then 21 shots on paper. 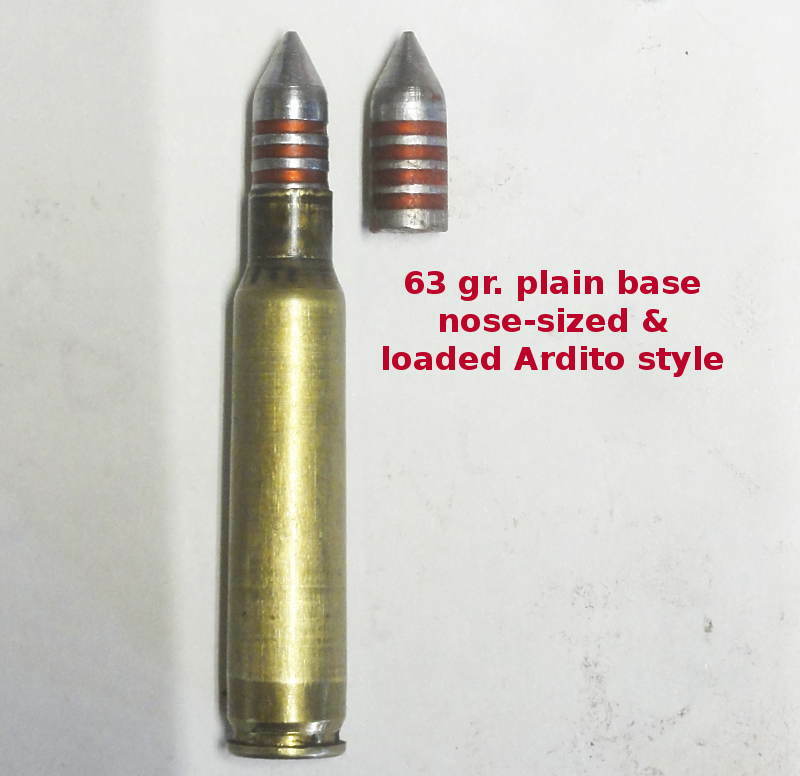 As often seems to happen with coated bullets, the first group from a clean barrel was not so great, but it seemed to shoot better after it was well seasoned. 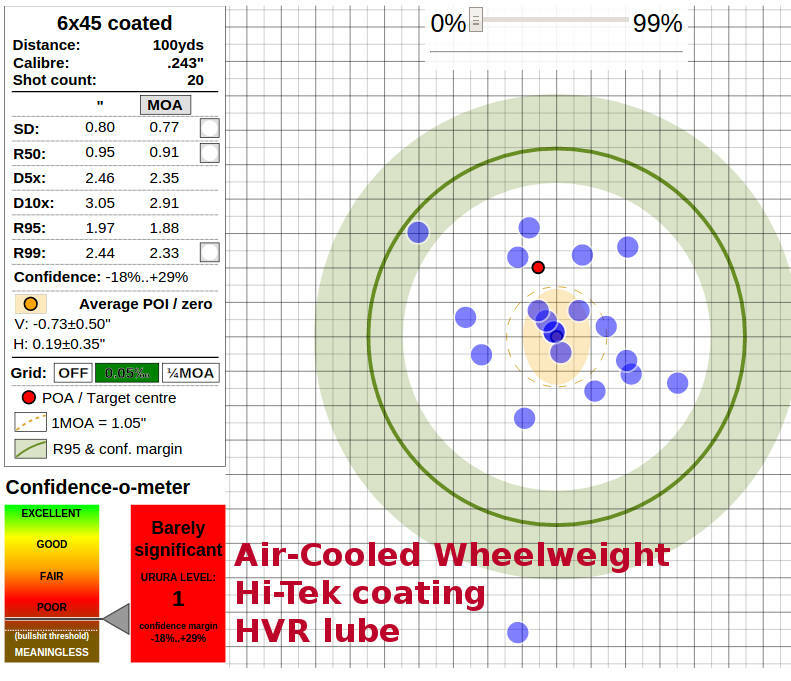 -- mean radius = 0.83"
-- velocity was nearly 100 fps lower than other coatings. That may simply be due to temperature because IMR4350 is temperature sensitive and it was a little cooler in the shooting shack today. -- I imagine that rather than using rattle can urethane, you could probably get equal results by shake & dry with highly thinned liquid urethane. It would cheaper in the long run, and no special fixture would be required. -- I'm not going to powder coat at this time because I haven't been happy with shake & bake powder coat, and I'm not currently set up with a powder coat gun. Maybe someday. -- retest polycrylic without lube. -- retest polycrylic with air-cooled WW rather than heat treated WW. The reason I want to do more tests with polycrylic is because I'm leaning toward making it my standard coating. It's cheap, easy, and I like the invisible look. But it remains to be seen if it will shoot as well as Hi-Tek without lube and without hardening.